The TE525METS-L, manufactured by Texas Electronics, has a 6 in. orifice and measures rainfall in 0.01 in. increments. It is compatible with all Campbell Scientific data loggers, and it is widely used in environmental monitoring applications. 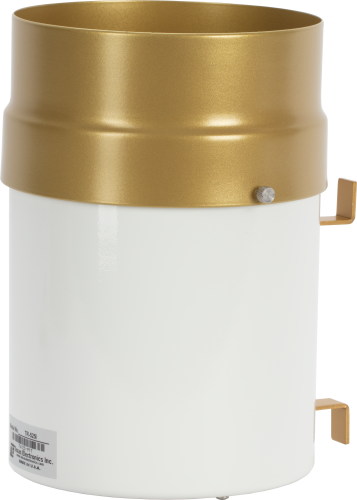 This rain gage has a special connector for attachment to the MetSENS550. The TE525METS-L funnels precipitation into a bucket mechanism that tips when filled to its calibrated level. A magnet attached to the tipping mechanism actuates a switch as the bucket tips. The momentary switch closure is counted by the pulse-counting circuitry of our data loggers. The TE525METS-L rain gage mounts to a CM300-series Mounting Pole or a user-supplied 1.5-in. IPS pole. Several pedestal options are available to secure a CM300-series pole to the ground (see Ordering Information). Accurate measurements require the gage to be level. The TE525METS-L is not designed for use with our CS705 rainfall adapter. Campbell Scientific offers the 260-953 Wind Screen to help minimize the effect of wind on the rain measurements. This wind screen consists of 32 leaves that hang freely and swing as the wind moves past them.